Wonder why you can't stop eating ice cream...for days? Seriously, I knew I was not to blame when I started eating a pint of ice cream and couldn't stop until my spoon scraped the bottom. How could I eat the whole thing? Must have been an imaginary spoon that helped me along of course! Thankfully new research has come out that says fat from certain foods sends off signals to the brain to keep eating so my spoon kept digging! Oh and they say this effect can last for three days so that ice cream binge is SO not your fault! Check out the full story on science blog. Cake and ice cream...the perfect duo and on a warm end of summer day even better. Oh and even better that Bethany was along to try it too! Now who would have thought a premade frozen cake would even be worth opening but let me tell you that Amy's Organic Orange Cake was so surprisingly moist and yummy. It had a great orange flavor that was not too overwhelming but perfectly refreshing and light. I am a baker (well, was pre-two kids!) and freshly baked cake is a must but my mind has been changed by this little vegan cake. Yes it comes in a box but when you open it, the cake is nestled in a sweet little cardboard cake liner that looks like it just came out of the bakery or your own oven. I give Amy's kudos for stepping up on the packaging...it goes a long way especially when you are trying to disguise it as your own! cream blog right?! So the topper of it all was Green & Black's Organic Chocolate Ice Cream. I had no clue who Green & Black was but come to find out they are amongst the elite of award-winning chocolate makers. Made from bittersweet dark chocolate and fresh organic cream its no wonder this ice cream was so smooth and rich. (But i do have to admit that both Bethany and I thought it seemed icy at first but it was just the top layer...think this one was in the freezer for a bit). With that said not sure I put it above my favorite Ben & Jerry's Chocolate but it is really good and has the organic factor working for it. All in all...love the combination of orange and chocolate and also love the fact that they are both all natural. Both Amy's and Green & Black's obviously are natural winners here. Next time I think I might have to try making my own ice cream with Green & Black chocolate. If anything its a good excuse to try the chocolate! Spice Dish escaped to Europe this summer, and lucky us, we get a perfect fall treat as a result! Bon Appetit! This flavor was inspired by my recent trip to Paris. One morning for breakfast, I happened across some apple flavored yogurt. Simple, but completely divine. Unlike anything I’ve ever tasted in the US. Maybe it’s because French dairy products, are well, actually made of dairy. Not a collection of chemicals and preservatives. Whatever the reason, I was in love. I couldn’t stop thinking about that yogurt and decided I hate to recreate it at home. This is rich, creamy, speckled with vanilla and perfumed with a hint of tart, green apple. Enjoy! With a cheese grater, shred apples (including the peel) into a medium saucepan. Stir in lemon juice. Pour 1 cup of the cream into the pan. Add sugar & salt. Stir. Scrape the seeds out of the vanilla bean and add to the mixture. Then drop the bean in. Warm the mixture until sugar dissolves. Remove from heat and add rest of cream and milk. Let steep, covered, for one hour. Strain into large bowl and chill completely. Churn in your mixer. For a caramel apple effect, top with a creamy caramel sauce. I've never heard of Howtoons before, but it is apparently "The World's Greatest D.I.Y. Comic Website"...pretty cool. Checkout this Howtoon below with instructions on making ice cream! Howtoons is closing out the summer with a contest -- use the Howtoon above to make ice cream, and send in your best recipe...you could be a winner! For more details, visit the Howtoons website. Since I couldn't find an "enter by" date, I sent an email to find out. The super nice (and awesomely quick at replying) folks over at Howtoons just sent me an email letting us know when their contest runs until: "Recipes must be submitted to us by the end of the day 9/21. We will then post the winners by 9/28." My awesome younger sister sent me this link from Bust a while back and I thought it would make for a nice post today as the kiddos are heading back to school. 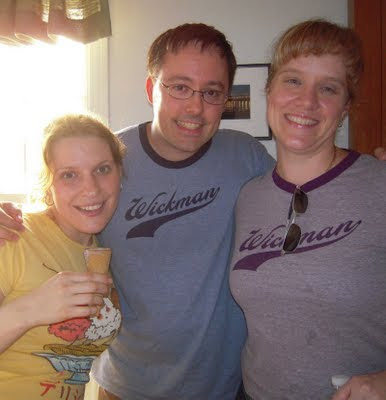 It's been more than a month that I have had to recover from the Great American Ice Cream Event of 2009, aka, I Scream 2009, my annual ice cream party. This is going to have to be a four part post, as you'll be tired by all my writing in one. Fifteen flavors per post, and the winners in the fourth. Stay tuned! Here's part one...as always, I am going to try to get up some good recipes, but if I am taking too long, feel free to bug me if you want a certain recipe. Amanda's Summer Garden Party (Strawberry Basil Sorbet) -- back by special request. You can see the recipe here. Arianna's Snap Crackle Pop (Rice Krispie Treat) -- I tried this one twice. Once I made a marshmallow recipe without eggs, and to me it tasted like frozen whipped cream. The next time I made a egg based marshmellow base. Both times I didn't like how the rice krispie treats got soggy. Not a fan, so unless you *really* want it, I am not going to try to remember the recipe and post it. I'll try to figure out how to unsog them and master this recipe. Ashu's Tango with the Mango (Mango Pistachio) -- I wasn't thrilled with this one. I altered the recipe from The Kitchn. Maybe if I hadn't altered it, I would have liked it! Batter Up (Cake Batter) -- yum! One of my favorites. You can find the recipe here. Caffeine Makes You Go Bananas (Caramel Coffee Banana) -- This was a mistake turned right. My first couple of coffee recipes just weren't working. This kind of burned so it was caramely. Whatever...when you make caramel, turn it into ice cream. I added bananas and voila! Caramel Coffee with Charlie and Lucy (Caramel Coffee with Two Kinds of Peanuts -- chocolate covered peanuts and circus peanuts) -- Same as above, second try still didn't work. This time I added the circus peanuts and the chocolate covered peanuts I had lying around. Crazy Sister Liz (Coffee with Salted Walnuts and Marshmallow and Caramel Swirl) -- Kevin's coworker (and our friend) Melissa suggested this one. Apparently her sister invented this to top ice cream. As Melissa tells it "She may be crazy, but boy can she put an ice cream creation together. My sister worked at White Mountain Creamery when if first opened in the 80's. This was one of her favorite concoctions. Obviously the toppings weren't made into the ice cream, but I think they'd be better that way: coffee ice cream, salted pecans, ribbons of caramel and marshmallow." I can't tell you what I thought, though...I am not a fan of coffee. Crowley's Coffee N' Donuts (Coffee N' Donuts) -- Another one of Melissa's brilliant ideas. Wonder why no one thought of this one before...Aptly named for Massachusetts's recent famous cop, Sargeant Crowley. Daveed's Bella Nutella (Nutella) -- Used the basic peanut butter ice cream recipe from Bruce Weinstein's The Ultimate Ice Cream Book, replacing the peanut butter, with, what else? Nutella. Double Your Pleasure (Fresh Mint with Thin Mints) -- This was actually made with fresh spearmint, which I didn't think of as I was making it. I have a jungle of spearmint in the backyard, which I thought I would use. I think it would have been better with mint mint. Ears to You, Betsy! (Corn) -- It wasn't bad...but I won't make it again, probably. 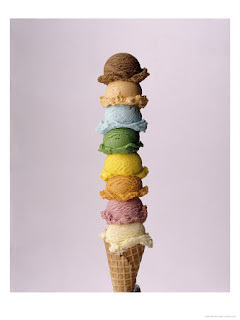 Also from Bruce Weinstein's The Ultimate Ice Cream Book. Elvis's Coronary (Peanut Butter Banana) -- Peanut Butter Ice Cream. Macerated bananas mixed in. 'Nuff said. Gail's Chipwich (White Chocolate Ice Cream with Chocolate Chip Cookies) -- Chocolate chip cookie dough ice cream and cookies 'n' cream are all-time favorites these days, but it is rare that you find actual baked chocolate chip cookies in ice cream. Well, thanks to Gail, we did! Awesome Gail suggested this one. Cookies were made from the New York Times recipe, which I accidentally let sit for 72 hours instead of 36. Patience? Nah. I enjoyed cookie dough for three days! Ice cream base was White Chocolate Ice Cream from Bruce Weinstein's The Ultimate Ice Cream Book. Grandma's Black Forest Cake (Chocolate Cherry Cake) -- In honor of my late Grandma Schlegel's black forest cake. This ice cream adaptation is one of my next recipes to post. Promise! Used Amy's Kitchen's awesome Frozen Chocolate Cake. Also keep your eyes peeled for Tina's review of the Orange Cake with chocolate ice cream! Heather and Lisa's Big Apple (Apple Butter) -- Had an extra jar of apple butter lying around -- once my husband mentioned he liked apple butter, and I think I over bought it for him...Recipe from...you guessed it: Bruce Weinstein's The Ultimate Ice Cream Book. Stay tuned for part two of the series! Hope you enjoy the glowing picture at right of me and Team Wickman! BE sure to note the other awesome present from Husband...the banana split tee! Thanks to Jenn Wickman for this photo as well! I love design. I love ice cream. I love freebies! Design + Ice Cream + Free = Perfection. Here's a cute ice cream freebie I first saw on Craftzine.com. At left, Melbourne-based designer Amy Moss at Eat Drink Chic offers free "Love and Ice Cream" Gift Tag Set Printables. These are awesome, Amy! Beautiful colors, handlettering, illustration -- all combined into perfection. Thanks for sharing! Oh, and while you are there, be sure to check out her directions for a not only tasty-looking but absolutely beautiful, charming DIY Ice Cream Parlour "Make Your Own Sundaes" Concept for a Wedding or a Party. A-MA-ZING. Hmmmm, we might have to feature Amy soon -- she's all that we love -- ice cream and great design! paper crave is another blog I follow regularly, and I came across this (inexpensive) little gem. 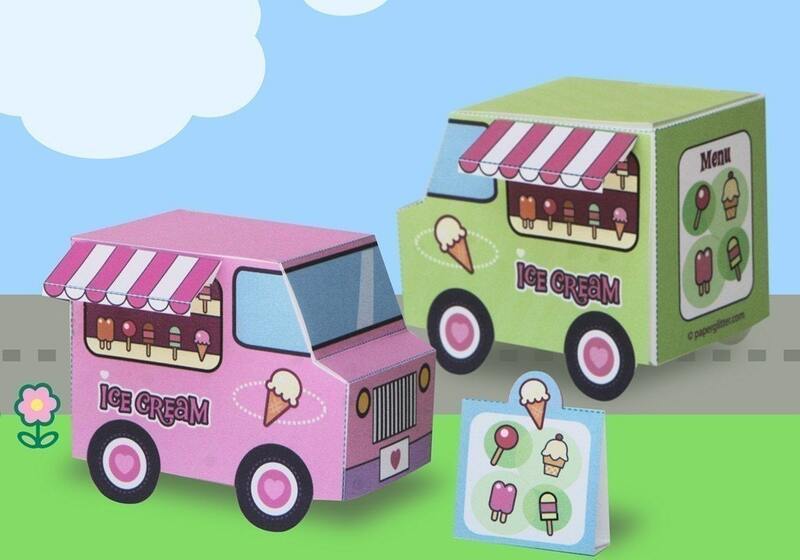 For $2.50, PaperGlitter sells PDFs to create your own little pink and green ice cream trucks (at right). So fire up your printer, sharpen your scissors, and let's show some ice cream love! 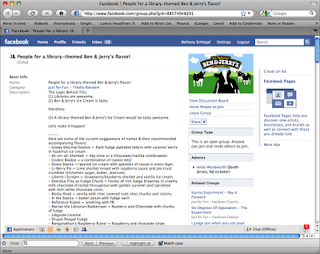 Ben & Jerry never ceases to amaze us here at Scoopalicious. 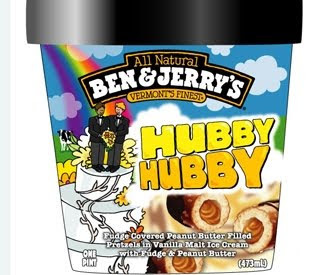 Beginning this week Ben & Jerry's is temporarily renaming their hugely popular “Chubby Hubby” ice cream to “Hubby Hubby” in celebration of the start of legalized gay marriage in its very own home state, Vermont. So for the next 30 days Ben & Jerry's, in partnership with Freedom to Marry, will show their sweet support of a great cause and is truly hoping this will raise awareness of how important marriage equality is not only in Vermont but everywhere. As the state motto goes...Vermont truly is for lovers (& not just ice cream lovers!)! 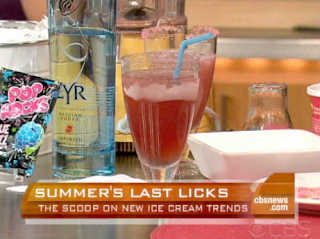 Just in time for all those labor Day parties....cool summer cocktails! This past Friday on The Early Show Somer Perez, a mixologist of Couture Cocktail Concepts, had me running for my blender with these hot summer cocktails. Try em out this weekend and we'd love to know how they were. Enjoy!